One of my favorite bloggers, Ariel S. Winter of We Too Were Children, Mr. Barrie, is having a banner summer. At the start, his first children's book was released - One of a Kind, and then his first adult novel, The Twenty-Year Death, came out shortly thereafter to rave reviews. And in the middle of all that, Ariel still had time to do a little write-up for VKBMKLs. The man is unstoppable, so let's welcome him. 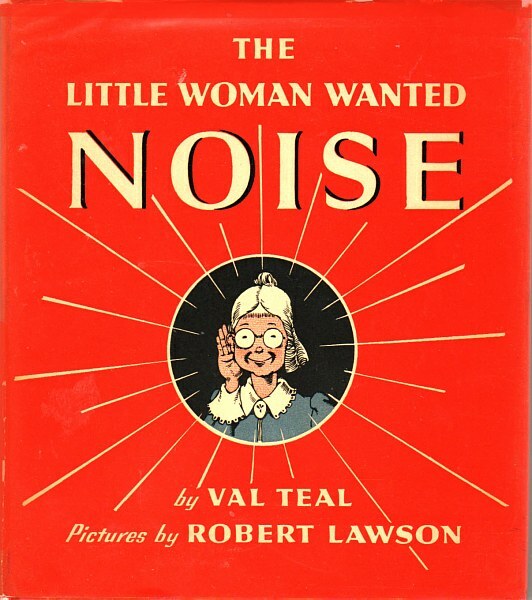 The Little Woman Wanted Noise (1943) was Val Teal's first book. It tells the story of a little woman who lives in the city between a shoemaker and carpenter and below a printer, so it's always noisy. Then she receives a letter from her cousin: "I am going to Australia and I give you my farm." So the little woman moves to the farm. "But she couldn't rest and she had no peace of mind because it was so quiet." She asks around about the best way "to get some noise on my place," and she's told to get some animals. 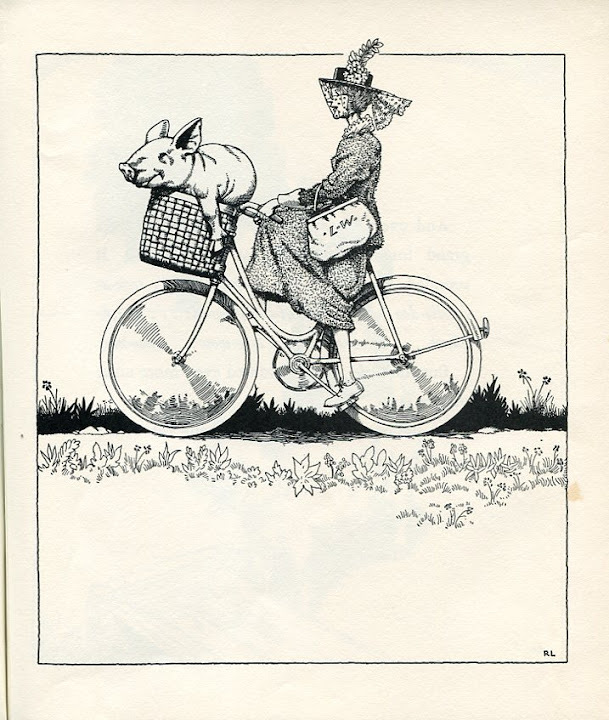 She gets a cow, and then a dog, and then a cat, and a duck, a rooster, a hen (who begets chicks), a pig, and "an old rattlety-bang car with a good loud horn," "but still it was not enough for the little woman." So she drives back to the city, and stops outside a boys' orphanage, which is the noisiest place she can find. She goes in, adopts two boys, and "After that, there was always plenty of noise on the farm...And the little woman had no rest. But she had peace of mind." The book is at base an animal noises books, with each new animal adding a sound to the list. Moo-moo, bow-wow, meow-meow, quack-quack, etc. The interesting thing about the copy I have, which is a 1967 reissue discarded library copy is that someone penciled in "corrections" to some of the noises. So the hen's "Cut-cut-cut--cut-aw-cut" has written above it "cluck cluck" every time it appears. And the pig's "sque-ee-ee-e-e-e" has "oink" written over it. Even the truck's horn is amended from "Goo-oo-oop" to "beep." Now, when my daughter was at the animal noises stage (do you remember when people asked you how many words your baby knew, and you would ask if animal sounds counted? ), I would approximate the animal noises as best as I could, regardless of how they had been spelled out in onomatopoeia. Why the librarian couldn't make those sounds on the fly during story time, but had to annotate the book is beyond me, but it adds personality and charm to our edition, even if I don't adopt the penciled suggestions. Val Teal (1903-1997), her full name was Valentine because she was born on February 14th, wrote at least one other picture book, Angel Child (1946) and what I believe is a memoir for adults It Was Not What I Expected (1948). Her bibliography at Gale Biography in Context is worded in a confusing way, but I believe what it is saying is that her work for children appeared in at least two dozen other books (anthologies), as well as in numerous magazines. She writes in her own bio for The Little Woman Wanted Noise that in addition to writing she is "an enthusiastic homemaker, she loves to cook and bake, to make rugs and piece quilts." Gale quotes her from somewhere, "I am a zealous conservationist and environmentalist. I wash dishes by hand, wash clothes with a wringer-type washer to conserve water. I hang them out to dry to conserve energy. I even make my own laundry soap and my clothes are cleaner and whiter than those washed with detergents which are polluting our streams. I have no garbage disposal or dishwasher. I have always baked our bread." She sounds like she was an interesting, fun, forceful woman. 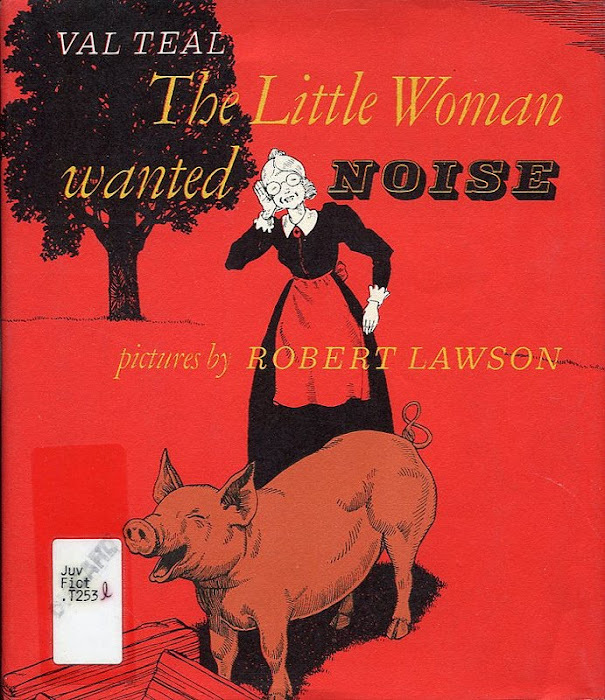 The illustrations for The Little Woman Wanted Noise were done by the master Robert Lawson (1892-1957) most famous for illustrating The Story of Ferdinand (1936) by Munro Leaf. 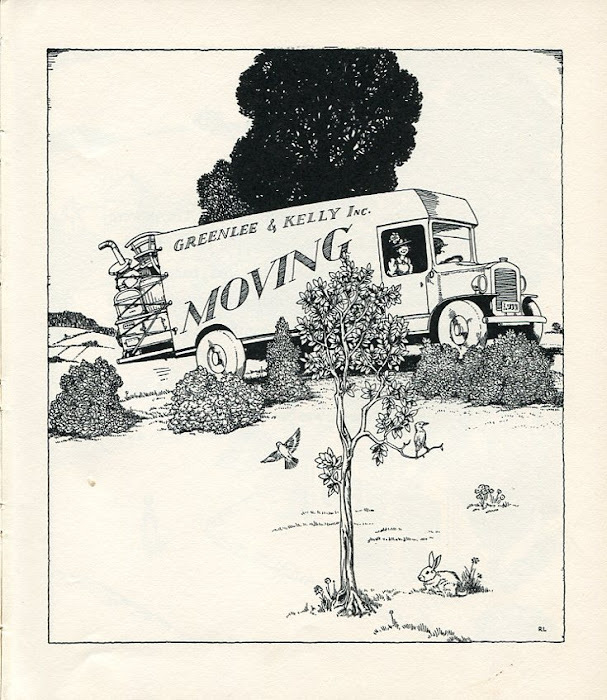 He is the only author/illustrator to ever receive both the Caldecott (for They Were Strong and Good (1941) and the Newberry (for Rabbit Hill (1945). The last thing I want to point out is that the title of the book is The Little Woman Wanted Noise and not The Little Woman WHO Wanted Noise. I find myself wanting to throw the "who" in there naturally, which is how that kind of title is usually written, but by leaving the "who" out, Teal makes the little woman more active and her title distinct. To see more scans of the book, check out Ariel's Flickr site. Thanks again, man! 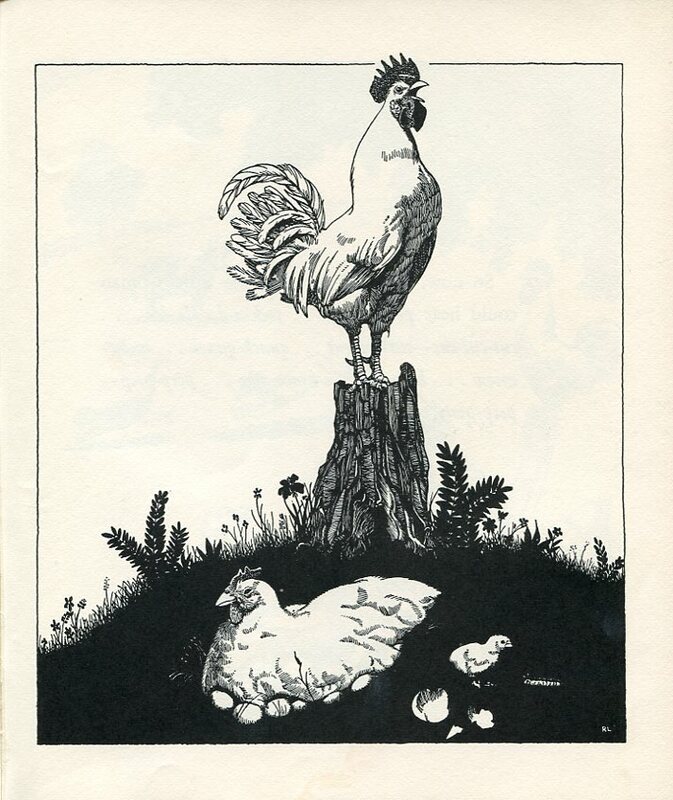 When it comes to drawing, Robert Lawson was the bomb! Thank you for the great review. This book looks wonderful and the author sounds like an amazing woman. 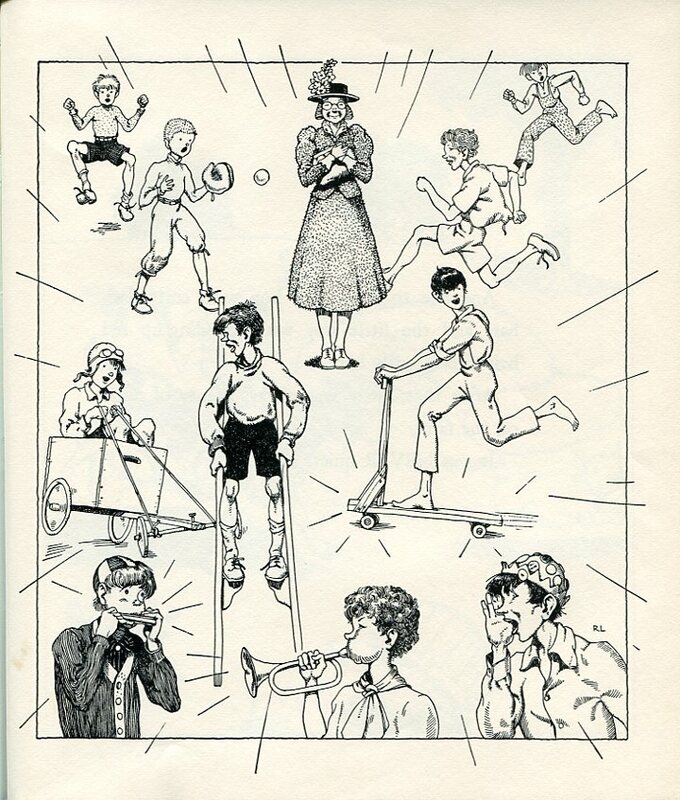 I know the illustrator is awesome.